One of my wardrobe resolutions for this year was to give the neglected 'house clothes' section of my wardrobe some much needed thought and attention. 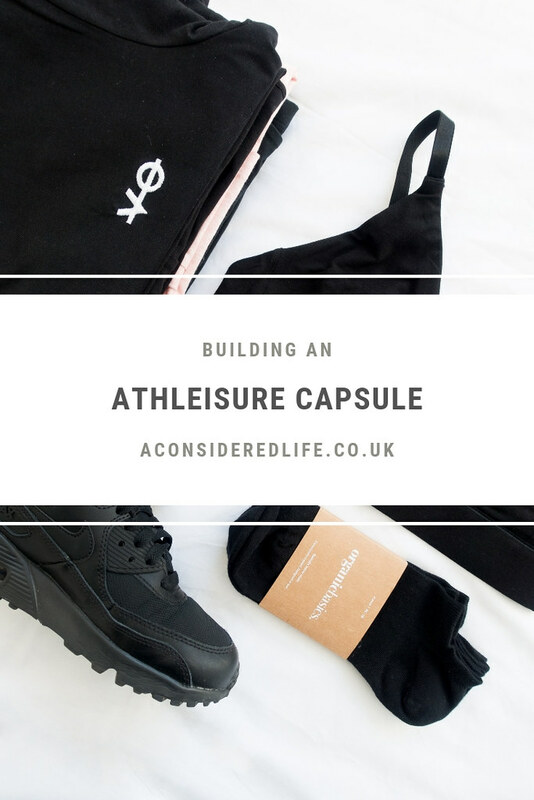 For the longest time I've struggled to find comfortable loungewear; now I've finally discovered what works (and what doesn't) and I've created a capsule around that. I’ve realised I prefer fitted clothing because it makes me feel more put together. I focused on easy to wear, versatile basics that can mix and match with each other. Instead of buying all new clothes (which right now I can’t anyway, here’s why!) I pieced my athleisure capsule wardrobe together from items I already owned. I made some calculated omissions (pyjamas and sweatpants) and committed to what I knew worked for me (smart sweatshirts and leggings). To create my athleisure capsule, I demoted items from my all-seasons wardrobe, pieces that look great and I love but didn't wear enough. If you're going to do this I recommend avoiding worn-out clothes and only choose items you feel great wearing. Just because you're wearing these things to stay comfy doesn't mean you can't look and feel good too. Don't deprive yourself of making purchases if what you already own isn't working for you either, it's a worthwhile investment. Investing in an athleisure capsule has saved me time and made me more comfortable when working from home and running errands. The best leggings I've ever owned. Made with thick 100% organic cotton and a little lycra for stretch and shape retention; these leggings are custom made to fit you just right making them look great on. They're super soft and comfortable, and I always reach for them when I'm working from home. Ideal for more active days, these leggings have all the softness and stretch as normal leggings and the moisture wicking stretch of activewear leggings. These are my go-to yoga leggings but I'll happily wear them whether I've got errands to run or I'm lounging at home. I've written up an in-depth review of Girlfriend Collective if you're considering a purchase. Made from organic cotton with a unisex fit and subtle embroidered detailing, these tees are super comfy. T-shirts are an essential for an athleisure capsule; they're easy to wear and versatile. 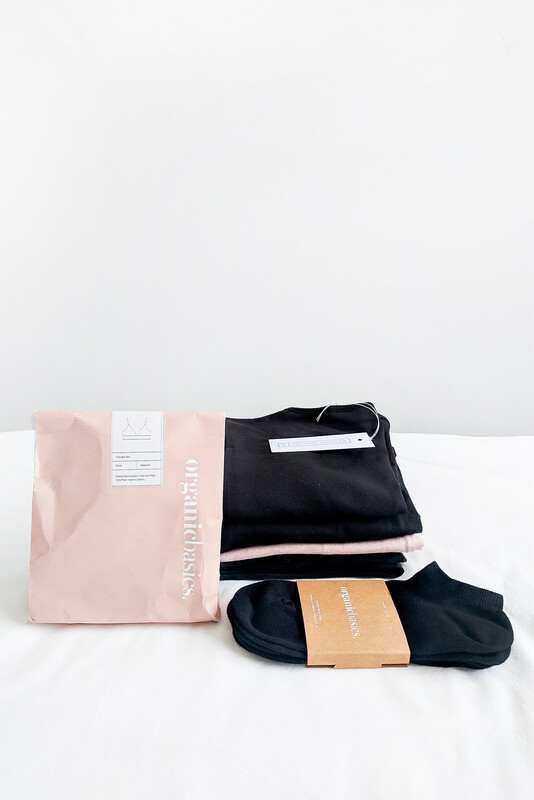 I wear the two I own - classic black and millennial pink - tucked into leggings with a sweatshirt on top or worn knotted at the front, either way these tees work really well. With every purchase, VO donates to animal sanctuaries to help rescued farm animals. A bodysuit is an essential in an athleisure capsule, in my opinion. It's a great base layer that's supportive yet comfortable. It gives a slinky silhouette, which is something I love whether I'm wearing it about the house or as part of an outfit. The White T-Shirt Co. bodysuit is made from soft mixed organic cotton and has poppers so no awkward disrobing in public restrooms. Just like the t-shirt, this sweatshirt is comfy and cozy. It sits right in line with my style and has become a regular go-to, serving as a layering piece in cooler weather; not too thick or too thin, it's something I wear all year round. I purchased my second-hand, similar to this one, and it's become a staple in my wardrobe. It's thin enough to layer underneath outfits or wear alone on cooler days. It's fitted yet stretchy making is super comfortable to wear, and has a lovely ribbed texture that makes you look more put-together than you actually are. I almost exclusively wear soft bralettes because, when you find the right ones for you, they're the most comfortable bras to wear. My favourites are the Organic Basics Triangle Bra* and People Tree Soft Bra, or for more active days the Organic Basics Everyday Bra* with SilverTech; an advanced antibacterial fabric that regulates your temperature and helps reduce sweat. What I love about the Organic Basics bras is the thick band, which keeps you secure without discomfort. Organic cotton is the way to go when it comes to socks because of their durability and comfort. Organic Basics Cotton Ankle Socks* are an excellent purchase for an athleisure capsule as they can be worn with trainers (or with smart shoes to make them more comfortable). What I like about these is they stay in place with no slipping or bunching up. Around the house I wear slippers, MUJI Linen Slippers in winter or Mahabis Summer Slippers* in summer. If I'm heading out to run errands, I put on a pair of trainers - something that's very new to me. I own two pairs: all black Nike Air Max 90 Trainers (purchased second-hand) and Ruby Shoo Trainers*. Both pairs are lightweight and oh so comfortable! A couple of tweaks help transition my athleisure clothes into more of an outfit. If I want to look a little dressier, I add simple jewellery like a necklace and earrings, and watch. It's a tiny adjustment that makes a huge difference to how you look and feel when moving from indoors to outdoors. If you want to stock up on Organic Basics, use the code: SOPHIEXOBCO15 for €15 discount. Some items in this post were gifted (marked with *) without any obligation to share.